1838, Tankara, Kathiawar( now currently in Morbi district of Gujarat)– A 14 year old boy named Moolshankar was keeping awake, during the Shiv Ratri Jagaran, at the local temple. So named, because he was born in the Mul Nakshatra, Moolshankar was a devout Shaivite, like his family, and by age of 14 had become well versed in Sanskrit Grammar, Vedas. While most of the other devotees in the Jagaran had fallen asleep, Moolshankar was still keeping awake. And then he saw a rat climb on to the Shiva Linga, and begin to eat the holy Prasad. He was shocked, how could some one called as Mahadev, allow a rat to jump on his idol and eat the holy Prasad. He asked his father the same question, who replied that the real Shiva, lives somewhere in Kailash, and we need to worship with real devotion. Moolshankar was not convinced with the answer, and that was the time he felt idol worship was pointless. Born to Karshanji Tiwari, a tax collector and Yashoda, Moolshankar grew up studying the scriptures, and he was prepared for a comfortable life ahead. Two incidents however had a deep impact on him, one was the Shivratri Jagran one, another was the death of his younger sister and uncle from cholera. The latter especially had a profound impact on him, and as he began to ask questions on life and death, his parents began to worry for him. They decided to get him off married at a young age, as was the tradition those days. Moolshankar however had made up his mind that the married life was not for him, and in 1845, he ran away from home. From 1845 to 1869, Moolshankar spent time roaming all over India, living an ascetic life. He was initiated into the order by Poornanda Swamy, and given the name of Swami Dayananda Saraswati. In 1860, he finally managed to meet the blind sage Virajananda, who was also known for his harsh temper, and strict attitude. He asked of Swami Dayananda to throw Kaumudi and Saraswatha, the 2 famous texts on Sanskrit Grammar in the Yamuna, and then asked him to start afresh. of Swami Dayananda willingly surrendered himself to Virajananda, who was quite a hard task master, known for his strict discipline. He would fetch water for his Guru, even in biting cold and rain, clean the floor, and even bore his beatings. Once after a very severe beating he had from his Guru, one of his fellow students asked him why he was bearing with this being a Swami himself . To which he replied “Do you think that our Gurudeva beat me out of hatred? Just as a potter shapes the lump of clay by pounding and beating it, the guru shapes the personality of his disciple by beating him and correcting him.” When the time came to leave the Ashram, his Guru, took a promise from Swami Dayananda, that he would spread the knowledge of Vedas, and revive Hinduism once more. Virajananda, felt that Hinduism had strayed from it’s original Vedic roots, and was corrupted by too many meaningless rituals. And he asked Dayananda to revive Hinduism, take it back to it’s Vedic roots, that would be his true Gurudakshina. As per the promise given to his Guru, Swami Dayananda, travelled all over the North to places like Ajmer, Haridwar, Jaipur, Meerut, Gwalior, spreading the knowledge of Vedas among ordinary people. He mentioned that Idol worship was never a part of the Vedas, and God has no shape nor form. 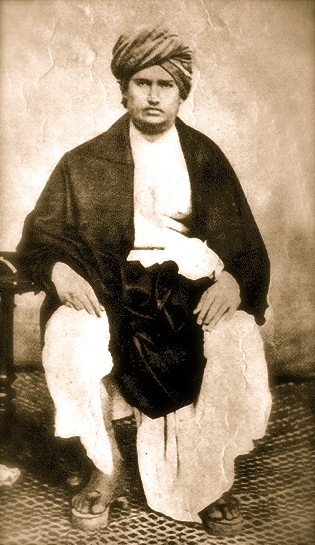 He fearlessly attacked the weaknesses of every religion, and spread awareness among people of the greatness of Sanathana Dharma, asking them to unite as one. On 22nd Oct, 1869, Swami Dayananda, had one of the greatest debates in Hinduism ever with 27 distinguished scholars of Varanasi, attended by the Maharaja of Kashi. Attended by 50-60,000 people, Swami Dayananda was ranged against some of Varanasi’s greatest scholars, as he debated with them on whether idol worship was sanctioned by the Vedas . So powerful were the arguments of Swami Dayananda, that the scholars had to admit their defeat. At this juncture, some of the unruly elements in the crowd, began to hurl, slippers, stones and rocks at Swami Dayananda, who nevertheless did not flinch. The chief Pandits of Varanasi, Taracharan Tarakaratna, Bala Shastri, felt remorse, and confessed “Really what Swamy Dayananda says is perfectly true. But we do not have the moral courage to go against the prevailing customs and traditions. So we have chosen to oppose him.” The Maharaja of Kashi impressed by Swamy Dayananda’s courage, wisdom and integrity, invited him to his palace and treated him royally. Though he was basically from Gujarat, Swamy Dayananda was convinced that there should be one national language, Hindi, and in fact wrote all his books in that language only. He was also a true nationalist, who loved Bharat, and aimed for the welfare of it’s masses. Once an Englishman impressed by his speech, asked Swamiji to go to England and teach them Dharma there. And this was his reply. In the few years of life left to me I shall try to spread the knowledge of the vedas among my countrymen. Once the lamp of wisdom is lighted here, its light is bound to spread towards the west too. He could have earned fame, going abroad, but for Swami Dayananda, his motherland, Bharat was far more important, and he missed no opportunity to spread the greatness of India. He advised Indians to awake, learn from their glorious history, tradition and use it to shape the present. He hated the present system of education that created contempt for India. In his own words. Your ancestors were not uncivilized men living in forests. They were great men who enlightened this world. Your history is not a bundle of defeats. It is the eulogy of the conquerors of the world. Your Vedic Scriptures are not the songs of cowherds. They are the immortal truths which shaped mighty souls like Sri Rama and Sri Krishna. Awake! Arise! Be proud of your glorious history. Take inspiration from it to mould the present. Shame upon the modern education which fills you with contempt for your ancestors!. A true nationalist, Swami Dayananda, felt that the only way India could achieve freedom was through armed revolution. The Arya Samaj, which was founded by him in Bombay on 10th of April, 1875, was ostensibly meant to propagate his goal of social reform. It however also became a crucible for nationalist leaders and the freedom struggle. Many branches of the Arya Samaj were founded in princely states like those of Udaipur, Jodhpur, and he aimed to bring together the princes to fight against British rule. The Arya Samajs all over North played a major role in shaping the nationalist, revolutionary ideas among masses. From Swami Shraddhananda to Lala Lajpat Rai to Bhai Parmanand, a whole new generation of freedom fighters, emerged from the Arya Samaj. Revolutionaries like Ram Prasad Bismil, Roshanlal were proud of their association with the Arya Samaj. Apart from his tremendous intelligence, Swamy Dayananda was also known for his exceptional physical strength too. He once stopped the carriage of a Maharaj, by holding it’s wheel, and in Kasaganj he took two bulls fighting on the streets by their horns, and managed to tame them. Dayananda always cared for humanity, he was sensitive to the sufferings of the ordinary masses as he once said –“ To love the creation of God is to love God Himself’. He fought against casteism, and other social evils, and wherever he went, exhorted people to shake off their lethargy. He was against the caste system, untouchability, child marriages. He fought for women’s equality, was against the purdah system, and stressed the need for pure conduct in one’s life. He made many aware of the glory of Hinduism, through his teachings. Many young Hindus, who were about to accept Christianity, changed their mind, after listening to him and became staunch followers. He also took back, people who had been converted by force into Muslims and Xtians, back to Hinduism, performing the Shuddhi rites for them. He was bitterly opposed to untouchability, calling it a curse on society, as he said. Untouchability is a dreadful curse of our society. Every living being has a soul which deserves affection; in every human being there is a soul worthy of respect. Any one who does not know this basic principle cannot understand the true meaning of the Vedic religion. Education was what Dayananda espoused, however he was against the existing Western system, which he felt only created people with contempt for native traditions. He favoured the Gurukul system, where students would stay with their teachers, and there would be no class, caste differences. The son of a King, and the son of a farmer would be the equals in a Gurukul, which would be located away from the city. Along with studies on Indian culture, Vedas, the Gurukul would also teach modern sciences like astronomy, mathematics, geology, so that the student receives a complete education. One of Swami Dayanand’s most famous works, was Satyartha Prakash( The Light of Truth), a 14 chapter book, containing his teachings based on the Vedas. His book, explained the importance of the Vedas, and it was critical not just of the bad practices in Hinduism, but even of other religions like Christianity, Islam, Sikhism. He declared that knowledge was not just about showing how to get salvation after death, it must also show a man how to live usefully in the world. He stressed on the need to follow the Vedic path of Dharma( righteousness), Artha( Wealth), Kama(Pleasure) and Moksha( Salvation). Back to the Vedas was what Swami Dayananda emphasized, and said, that while the main aim is salvation, unless we have a worthy life, we can never attain salvation. Dayananda was fearless in his pursuit of truth and knowledge, even in the face of great dangers and threats. Once a Christian preacher threatened that he would send him to prison, if he continued to show the faults in religion, to which Dayananda replied “My friend, was not Jesus Christ crucified for speaking the truth? But I fear no one to speak the truth.” While he was fearless enough to point out the faults that had crept into Hinduism, he did not spare Islam or Christianity either. And this frank, honest attitude of his earned him many enemies, from all religions. As he once said to a person who threatened to cut him with his sword. However the end came well and nigh at Jodhpur, the Maharaja there was a follower of Swami Dayananda. The ruler however spent a lot of time with a dancing girl Nanhi Jaan, and was rebuked by Dayananda, who said his action was not proper conduct for a Kshatriya. The offended Nanhi Jaan, conspired with the cook to poison Swamiji, and asked him to mix powdered glass pieces in his milk. Dayananda drank the milk and realized he had been poisoned, tried vomiting it out, but was too late. Sores broke out all over his body, and Swamiji had to suffer torture, due to the pain. When the cook confessed that he had poisoned Swamiji, he gave him some money, and asked him to run away, because if he were found out, he would be hanged to death. Though the Maharaja shifted Dayananda to Mt.Abu for better treatment, it was of no avail. And on Oct 30, 1883, the great soul passed away on Diwali day, uttering the word Om, in presence of his disciples. Thus ended the life of one of modern India’s greatest thinkers, a social reformer, a nationalist, a writer, a man who taught Indians to speak and think fearlessly. Swami Dayananda Saraswati, a truly great son of Bharat. This entry was posted in Great Indians, Hinduism, Social Reformers. Bookmark the permalink. Dayanand Saraswathi is a great person. Great. Many thanks for writing this.